Come August, and hypermarkets across the country begin pushing their back-to-school promotions. The items that are normally on display include backpacks, lunch boxes, water bottles, etc. in all kinds of Disney/Marvel characters. Then, there are also book and stationery needed for the kids’ new academic year. But with traditional books, retailers are now pushing the sales of new digital ones as thousands of children start school next month. An increasing number of schools in the UAE are now encouraging the use of tablets in the classroom, some with specifications whereas others still limiting themselves to the favourite Apple iPad. According to electronics retailer Plug-Ins, the sale of IT products, tablets and its related accessories is expected to go up in the weeks to come. 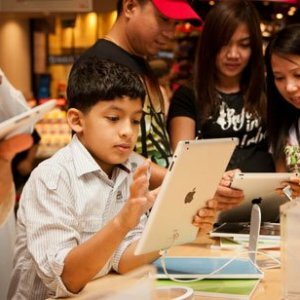 “The consumer electronics retailer expects sales of notebooks, tablets, laptops and smartphones to be popular choices among parents looking for the latest gadgets to help their kids with school work,” the company said in a statement. “The back-to-school period is one of the busiest times of the year as parents look to buy the latest IT products for their kids. This year, we anticipate an increase in some of the most popular IT products as more educational institutions look to digitize their notes and reading material,” it added.